SRINAGAR: An official said that the gunfight broke out in Wani Mohalla area of Khudwani at 11 pm after forces launched a cordon-and-search operation. Four civilians and an army soldier were killed and sixty civilians injured during a gunfight and ensuing clashes in south Kashmir’s Kulgam district on Wednesday. An official said that the gunfight broke out in Wani Mohalla area of Khudwani at 11 pm after forces launched a cordon-and-search operation. “During the search operation, some gunshots were heard after which an encounter started. The gunfight is still underway,” he said. He said that three forces’ personnel were wounded in the firefight. The injured were shifted to Army Base Hospital where a soldier succumbed. Two militants of Lashkar-e-Toiba are believed to be trapped inside a house. Authorities on Wednesday suspended Internet services in twin districts of Kulgam and Anantnag. Clashes erupted near the site of the gunfight as the youth tried to disrupt the anti-militant operation and help the militants escape. Forces fired live ammunition, pellets and tear gas to disperse the protesters, resulting into death of four civilians, reports said. The deceased civilians were identified as Sharjeel Ahmad Sheikh (28) of Khudwani, Bilal Ahmad Tantray (16), Faisal Illahi of Melhoora Shopian and Aijaz Ahmad Palla of Bijbehara. Dar of Kujjar village in Qaimoh tehsil of the district was declared brought dead at sub-district hospital Qaimoh. 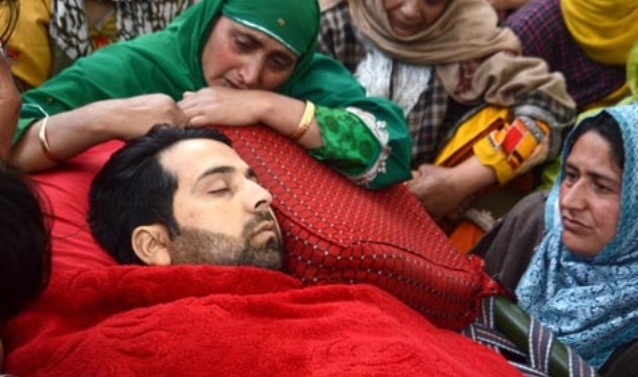 Sheikh was killed after being hit by a bullet during clashes near the site of gunfight in Wani Mohalla of Khudwani. He succumbed at District Hospital Anantnag. Faisal Illahi, a resident of Sangam area, succumbed at SDH Qaimoh. Aijaz Ahmad Palla was rushed to a nearby hospital where he succumbed, said a local. Reports said that sixty civilians have been injured in the clashes. At least two with pellet injuries in eyes have been shifted to a hospital in Srinagar for specialized treatment.Six others are being treated at SMHS hospital.